Best motel on Cape Cod! Over the years I’ve sent numerous people to the Even’tide. To a person they reported that it was the best motel on the Cape. And they have sent others. I can always arrive at the Even’tide and expect clean rooms, hospitable service, congenial fellow patrons and a sense of peace and safety. Building a business is more than building a physical facility. You understand that. As a result, I and others have developed a loyalty to you and a respect for your property. We sure did enjoy our visit with ya’ll. Having never been to New England, we did not know what to expect. You made us feel very welcome. We felt like part of the family. (Off-season) was good for us since we do not enjoy crowds. We liked feeling like we had the entire place to ourselves. There is so much to see there. Our suite was nice….We have already sung your praises to our buddies. I think everyone should visit ya’ll. When I get in a fizz, it is a calming thing to think of our time on the outer cape. I do know our last visit was entirely too short. My name is ******* and I live in Dortmund/Germany. I just passed by surfing when I remember that I spent wonderful days in your motel in September (Oh so long ago!) I came to Cape Cod together with my formerly fiancee. (We got married in June) shortly after finishing my thesis (I’m biologist) and needed a lot of recreation (and I can ensure that I really found everything that is necessary to get it). We spent – I think – about 10 days in the studio and my wife and me really loved it. It was so wonderful that we plan to return during spring or early in the summer, because I’m going to work at Yale for 2 or 3 months next year. My husband and I enjoyed our stay at your motel, the many helpful suggestions by your staff regarding places to eat, the walk to the ocean, etc. You treat your guests with respect and good humor. We will recommend your facility to all who inquire. We would like to take this opportunity to say “Thank You” for your warmth and hospitality during our recent stay at The Even’tide. We found our accommodations very comfortable and charming, and we felt pampered and spoiled by the housekeeping staff. We also enjoyed our dip in the pool. Your restaurant recommendations were excellent. We will definitely stay with you again, and we are already looking forward to our next visit to Cape Cod. Again, many thanks!!! 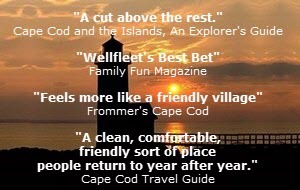 …we had spoken earlier regarding the travel article that lists The Even’tide as one of the best on the Cape shown in Family Fun magazine…this is a wonderful little place given the various degrees of skill and caring one might not find in a “chain” establishment. 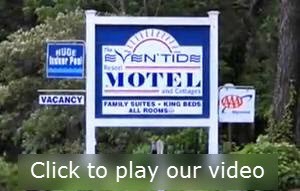 We just wanted to say that we had an excellent time visiting Cape Cod and staying at your motel. We were very surprised and pleased about your motel/resort. First of all, we were concerned because the price was lower than what we expected. We thought that we were getting a “cheap motel.” Second, we saw your homepage and thought that the pictures may have been doctored up. And finally, we had never been to Cape Cod and we were unsure of your location compared to other motels locations. When we arrived we found a clean, larger than expected room. The photos did lie…the room looked better than the photo’s projected. 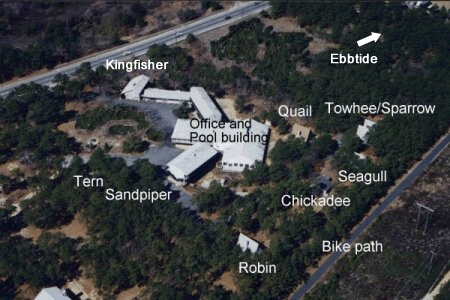 The staff was helpful and the location was perfect for visiting Cape Cod! We may not return to Cape Cod for a while, but when we do, we plan to stay at The Even’tide. We also will tell others of your motel! Thanks for a good time! We got home last night. We had a great visit. … A sixteen day vacation was great…. We like your home page. … My wife & I really had a good time. Thank you for your numerous ideas of things to do and places to go. We visited Cape Cod, and stayed at the Even’tide in Mid-October. Just wanted to let you know we considered your facility #1 of all we booked for our East Coast trip we had wanted to take for 30 years. Please be proud of your facility and the fine service provided by you, your wife, and staff! My husband and I just returned home after a delightful week in your perfectly charming Motel. It was a “first-time” visit to the New England states for both of us and I wanted to extend our THANKS for making our stay there one we won’t soon forget! Your courteous staff and warm friendly, family atmosphere made us feel completely at home! I especially commend whoever took the time to compile the extensive Restaurant Guide in your lobby. We used it faithfully to seek out some really wonderful places to eat…. I miss the seafood already! Thank you again for your hospitality!